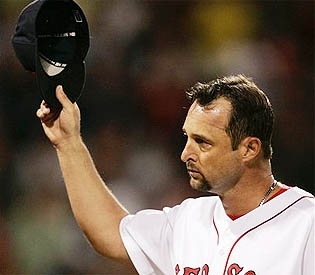 Forty-five year old knuckleballer Tim Wakefield has just announced his retirement. Although many Sox fans saw this coming, it is going to be a weird sight this year without Timmy coming out of the pen or pitching every fifth day in the rotation. Through his 19 year career, he played 17 years with the Red Sox and contributed many great memories during his tenure. He was never the most talented pitcher in the league, but he never complained and helped the squad in every way he could. His rubber arm was crucial during spot starts in the dog days of the summer when other starters were injured or needed a rest. He won 200 games and had 2156 K’s in his long career, and also had 22 saves. Although he will never make it into the Hall of Fame, what he gave to the Red Sox organization in the last 17 years can never be replaced and I hope someday his number hangs with Teddy Ballgame and the others in Fenway Park. In honor of Timmy, sadly we won’t be seeing this knuckleball anytime soon. This entry was posted in Red Sox and tagged al east, boston red sox, boston sports blog, retire, tim wakefield by TOB$. Bookmark the permalink.